Empty Centres is a dialogue between the works of two artists with differing but complimentary practices, whose pieces have proved to both intersect and oppose each other’s logic, a dynamic which is reflected visually. Even at first glance the visitor can gain a sense of one artist working with linear formality, while the other is more governed by the ideas that bring about an organic object. 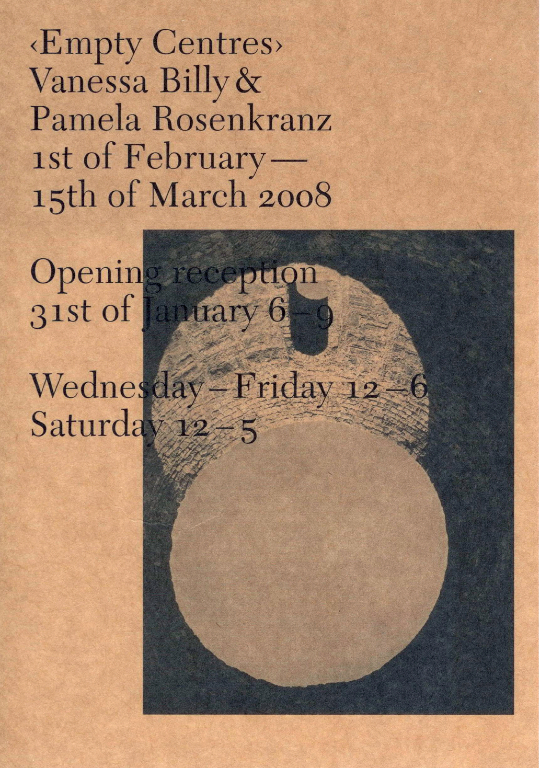 Pamela Rosenkranz studied in Bern and today lives and works in Zürich. Her works begin with a concept and their form follows; it is as if her works exist to give a thought a physical space in which to resonate. In her own words: ‘To me the core of an artwork seems like a gap or a hole and the artwork itself is organized around this hole’. Thus one can read the work ROOM, a set of mirroring doors placed at a 90° angle creating an illusion where the door and the room it exists in become one, as the expression of an object and the environment it depends upon, central to which is a projected centre. To reach a centre, something must be split. The object becomes two halves and so collapses in its own timeline, it shows itself as standing in-between birth and death. Most of Rosenkranz’ art is informed by philosophy and literature, seams of thought that permeate the works but do not dictate or fetter them. Indeed Rosenkranz enjoys the freedom to posit the absurd, using juxtapositions of media and subject matter to test theories. Her light touch allows her to create works that can be both grave and ludic, borrowing ideas and taking them to logical and illogical extremes. Vanessa Billy was born in Geneva and today works in London, having studied there at Chelsea College of Art. Picasso’s words, which Rosenkranz has placed on the work Aphanisis, ‘I do notsearch, I find’ are also indicative of Billy’s practice. She is led by a process of intuitive and continual gathering of source material, often overlooked or unexpected media. The transformative act of making this media her sculptural work is not merely an instinctive process but one of learning and responding intellectually to the tangible nature of the material, bringing it to a new conclusion while respecting its inherent qualities. Not to be ignored, her titles, an integral element of the works, direct the viewer to current and personal associations. Thus 12 Sensations, combining a found pink garment and a cast concrete frame formally arranged so severe and soft materials contrast, may gain its title from the shirt’s labels, but the title signals new possibilities and an open conclusion. Billy hesitantly describes herself as a sculptor, wishing not to categorise herself in a traditional framework, but mindful of how her works function and are read, and aware of cumulative art history. She plays with the codes of sculpture and modes of display to ultimately question the experience of a thing. Whether a work is as solid as 12 Sensations or as liminal as Sunny Agnostics, the meeting with the work is in space, where the object is the carrier of meaning and histories. The artists chose the title Empty Centres together, an assertion of the role of the inconclusive. The title grew from Billy and Rosenkranz’s shared ideas; coined several weeks before the exhibition and it has proved to be an apt vessel for the concepts common to the works and a principle by which the exhibition was organised. Just one of the many ways it can be read as the central core or gathering place in a settlement – to function as a place of gathering, beginning or a conclusion it must be empty.